How do you discover what it will take to win? Within the CapturePlanning.com MustWin Process we measure progress and quality against what it will take to win. During the critical pre-RFP phase of the pursuit, we use Readiness Reviews to ensure measurable progress. For each of the four Readiness Reviews, specific questions, goals, and action items must be completed. Within our process documentation we provide a nice long list of the specific questions, goals, and action items you can use to arrive at RFP release ready to write the winning proposal. 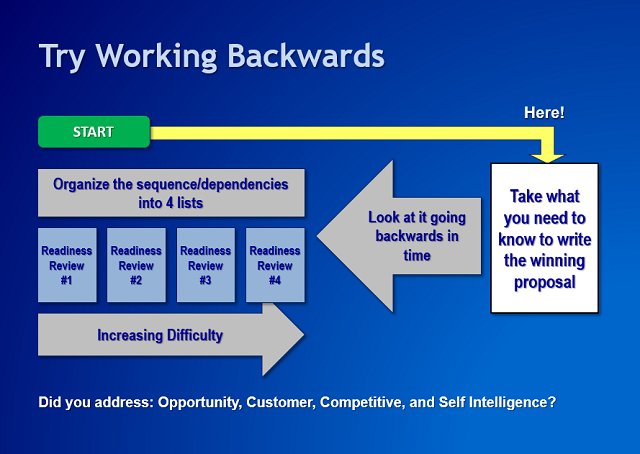 The purpose of this graphic is to help you understand how to design and customize your Readiness Reviews in order to know what it will take to win. Also, it helps the people executing the process to see how the Readiness Reviews "add up" to knowing what it will take to win. What does the RFP tell you about how to win?